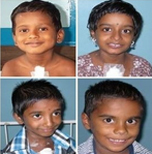 Dr.Mani Children Heart Foundation is a non-profit that builds awareness about Congenital Heart Defects and raises funds to sponsor life-saving treatment for children from under-privileged families. Smiling little hearts that YOU helped to heal. Behind every smile there's a heart-warming story. Click on a photo and read the child's story. You'll smile, too! 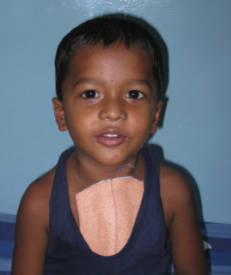 This little trooper had been struggling along gamely, his heart straining under the burden of a large hole inside it. You've made him smile again. Thank you! 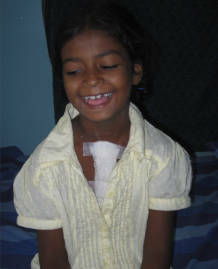 The 9 year old displays a wide, toothless grin four days after open heart surgery to repair a hole in her heart. Today, she's healthy and happy - thanks to you.